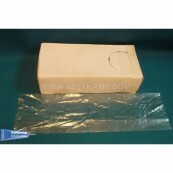 The disposable cover measures 26 cm wide X 60cm long. Top quality plastic, no problem with transparency. Available in cartons of 500pcs.